The high performance luminaire is designed for area lighting applications where long life, low maintenance, and consistent color rendering is required. Areas with limited accessibility due to fixture location or where heavy pedestrian or vehicle traffic makes maintenance difficult are ideal applications such as parking lots or walkways. 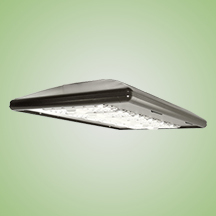 It is also compact and versatile enough for general purpose security lighting. Made with a state of the art UV stabilized acrylic high performance refractive optical assemblies that use high transmicity materials to achieve precise photometric distributions. Available in Type II, III, IV, IV Automotive, V Medium and V Wide beam configurations. Star Light Friendly (meets or exceeds Dark Sky requirements) in the horizontal position. Fixture will accomodate a horizontal 2-⅜” OD tenon directly into the back of the fixture (See TH Series Mounting Accessories). Additional mounting options may be available for custom applications.